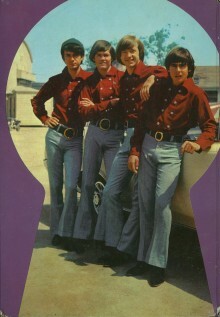 Last week marked the 49th anniversary of the airing of the first episode of The Monkees’ television show. The Pre-fab four was an instant hit and once the band lived on for years after their show and been cancelled and the four actor/musicians had gone their separate ways thanks to the magic of syndication. Still, it was the charisma of the four Monkees themselves, Davy Jones, Mike Nesmith, Mickey Dolenz and Peter Tork, who carried the show and made it the pop culture touchstone that it was. So we offer up a “Hey, hey” for The Monkees.